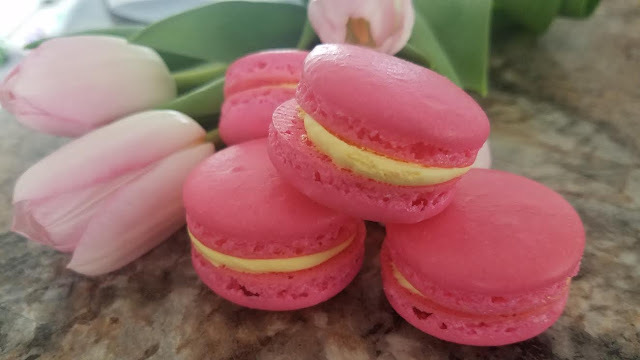 If I had to pick one food that represents the relationship I have with my daughter, it's a macaron. She loves them and honestly, because she loves them so much, I always think of her when I see them. Her birthday is coming up next month and she's asked for a tea party, complete with macarons for all her guests. 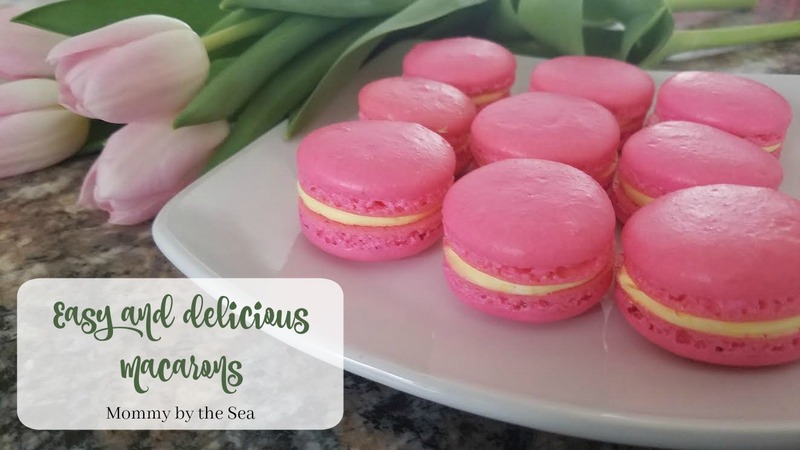 Have you ever priced out macarons? Those little things run anywhere for $2-$3 a piece. Multiply that by her entire class and their parents, plus our family members, and that's just not happening. I figured I'd give it a try and see if I could make them myself. Honestly, I was petrified. These have a reputation of being super difficult. 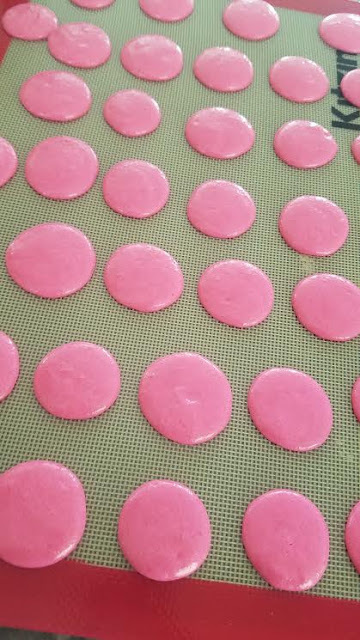 I followed the recipe almost exactly, but added in a splash of raspberry extract before adding the dry ingredients. I decided to cook them in small batches, just in case. The most important step is letting them crust over on the counter before cooking. The recipe said 20 minutes; I waited 30. The recipe said to cook for 13 to 20 minutes, mine took 22. They were a "constantly check" and then excitement when they'd come out right. For our middles, we simply added some lemon extract to an easy buttercream recipe. Emmalee was super excited to see the final product and spent the night coming up with flavor combinations and colors that she wants at her party! While I'm excited to make them for her party, I was more excited tonight to enjoy one (or three) as a small gift to myself this Mother's Day. What flavor combination should we try next? Disclaimer: Many of the links in this post are referral links, meaning I may receive a bonus from these apps if you decide to join. However, I really do love and use the sites and want to share! Okay, so maybe not for free but I've paid off a bunch of our upcoming trip already without spending any money from my bank account! I use gift cards that I earn for free. Now hear me out, this is not the "take 17 surveys a day" thing. 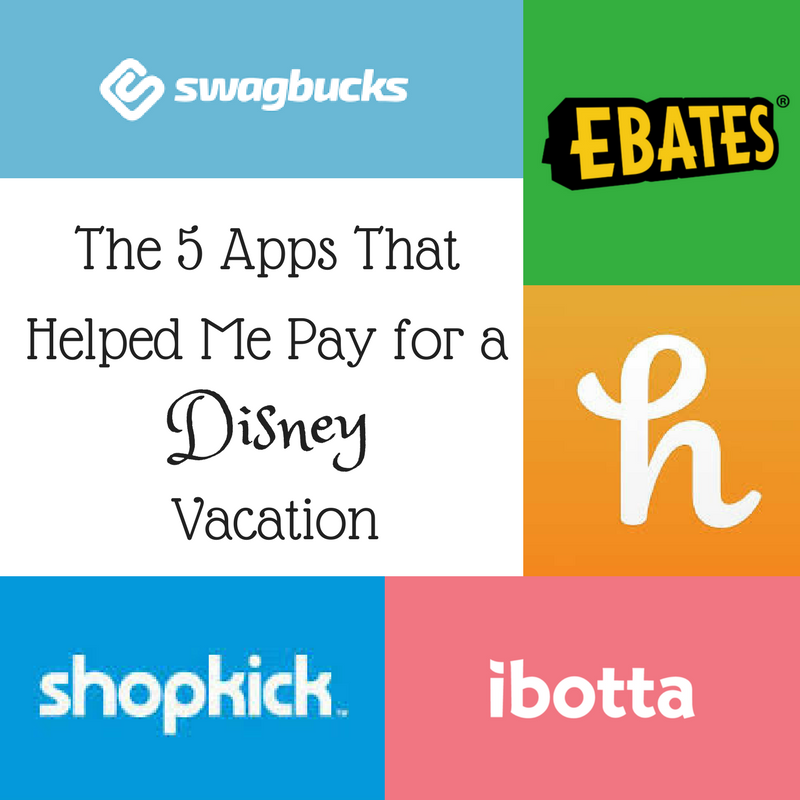 I use 5 major apps that help me out, both when I shop online and in store. Swagbucks helps me before I shop. It's a simple chrome extension that creates a little blue button. When you click on that button it opens up a search bar. If you search from there, instead of Google, you can get points just for that! Swagbucks also has a shopping option and if you click through to the featured sites you can get anywhere from 1-20% of your purchase back in Swagbucks! As you accumulate Swagbucks, you can redeem them for gift cards to lots of places, including Starbucks, Amazon, and Target! Even if you're not a big online shopper, you can link your card and gain points while you're out and about! Honey is the other program I LOVE for online shopping. While Swagbucks works at the beginning, Honey works at the beginning or the end. Again, it is a chrome extension, that creates a little button (see that grey H next to the swagbucks button?) for you to click on when you are shopping. 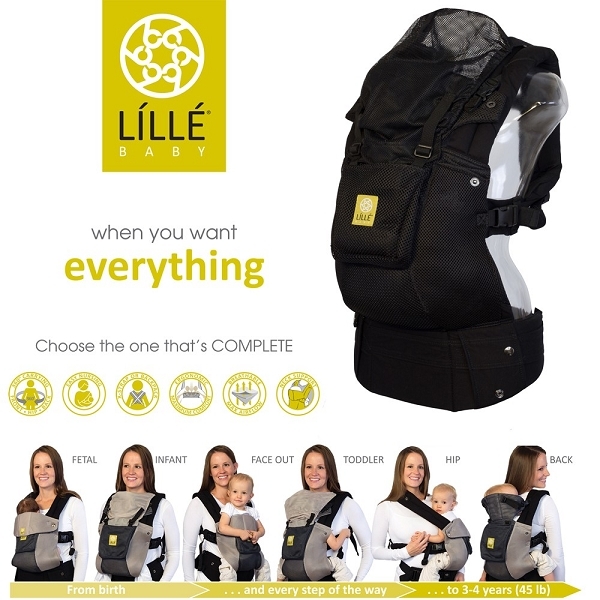 You can start with Honey, and click through to stores to activate a honey cash bonus, or you can wait for check out and honey will ask if you want it to search for online codes to apply to your order! You get a percentage back as Honey Gold. Honey allows you to redeem your Honey Gold for Amazon gift cards (paypal is coming!) at a minimum of a $10 card. This morning, I cashed out for $30 worth of Amazon gift cards! Ebates is a bit different because rather than accumulating points to cash out for gift cards, you get a percentage of your money back when you shop through the site! Like The others, you can begin by searching for a particular website through the Ebates page and find lots of great discounts, plus you'll see the cash back percentage. Shop as usual. If you accumulate more than $5.01 over a predetermined 3 month period Ebates cuts you a "big fat check" (or send it through paypal). All of these applications are FREE and give you FREE MONEY! Amazing! 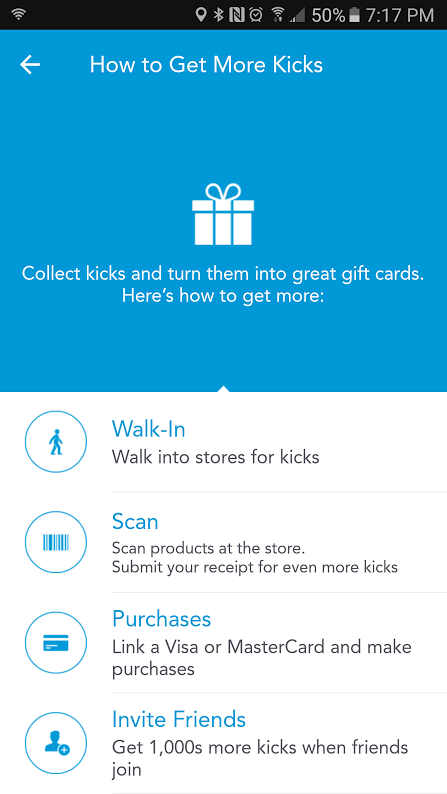 Shopkick is a mobile app that gives you points just for walking into particular stores! I especially love this at the mall because I can get a few hundred points just by walking the mall once! If the walk-in points aren't enough, they offer points for scanning particular items in the store and then even more points if you purchased certain products! Target is a favorite for us for scanning, since we're already walking around the whole store anyways! Once you reach a certain amount of points, you can redeem them for gift cards! The gift cards include TJ Maxx, Starbucks, Game Stop, Best Buy, Barnes & Noble, and Target! Again, free money for very little "work". Ibotta is actually a program David got me hooked on. It works a lot like Walmart's Savings Catcher but for LOTS of stores. 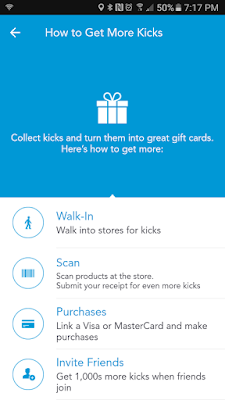 Before shopping, open the app and check for any available rebates, then shop as you normally would. You scan the barcodes of the products that had rebates and then snap a picture of your receipt! Ibotta deposits a bit of money back on to your account and as long as you have at least $20 in your account, you can cash it out to Paypal, Venmo, or a gift card! I love that Ibotta allows you to link up your loyalty cards as well! This morning I was able to withdraw $150 worth of Target gift cards that I then used to purchase Disney Gift Cards that I then applied to the balance of my Disney trip through the My Disney Experience site! That isn't even including the Honey Cash that became Amazon money! Amazon doesn't carry Target or Disney Gift cards but they have Starbucks (can be used inside the Disney Parks), T-Rex and Rainforest Cafe gift cards (both at Disney Springs), and great Disney merchandise to bring with us! 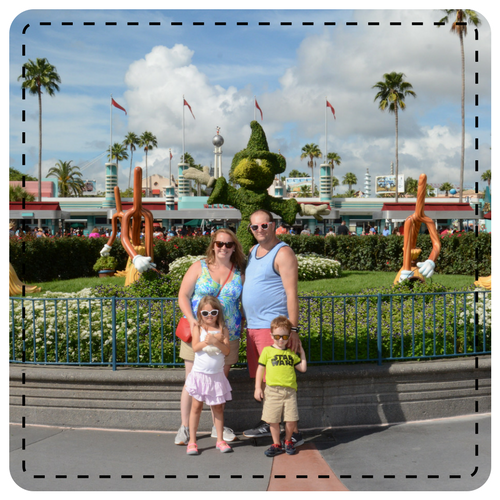 It might not be a free vacation but we usually plan our Disney vacations at least a year in advance so it's a great way to start saving up without ever taking any money out of your bank account! What are your go to websites for saving money?